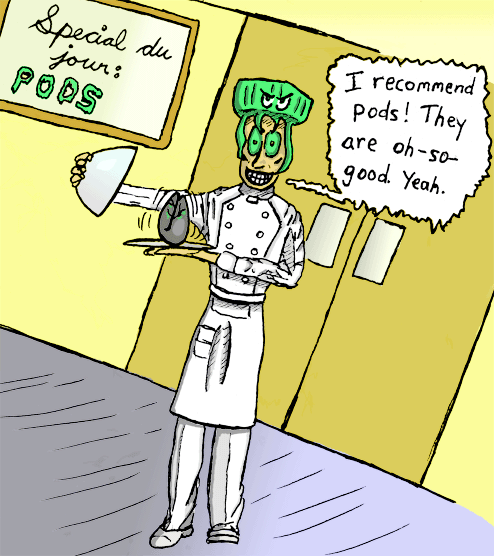 Ah, pods. How long it's been since I drew their delectable, cerebral-controlling wonderfulment. Here's a simple pod recipe: 1 pod, 1 you. Mix. Enjoy. It's oh-so-simple. All you have to do is approach it and the rest just sort of falls into place. Generally more silliness and a new area for pod-fun. Note the pod chef hat. And also a bit more playing around with shading. This time I remembered to scan in the drawing as black and white, which made the coloring a lot easier as there was far less noise. Oh, and his right arm is freakishly long. This is merely nothing more than bad drawing.